One of the biggest shocks that has come from the new #RhuleofLaw in Waco has been the physical nature of Baylor Bear practices. This has been a major departure from the Art Briles regimen of extremely rep-heavy, up-tempo practices designed to get as many reps in as possible every day. Most teams find that these up-tempo, rep-heavy practices make it hard to build a strong defensive culture. Problems emerge when you don’t practice tackling regularly, you don’t build habits pursuing the ball as a defense every play (because you’re hurrying to snap the ball again), and coaches can’t point out bad habits as they occur with regards to run fits and techniques. However, the Bears still managed to build strong defenses. I attribute this partly to Phil Bennett and his adaptability, the simplicity of the Bears’ defensive scheme, Briles running a pretty physical program overall, and the Bear defenders typically getting redshirts and tons of practice defending the most difficult spread schemes. If you ask Manny Diaz (currently DC with the Miami Hurricanes) about his philosophies for defense in the modern, spread RPO revolution era he always starts by emphasizing the importance of culture. Without a strong (and probably fairly martial) culture it’s hard to get guys to play physical and self-sacrificially in the way a good defense must. If you have 11 guys working in concert and playing tough, you can play pretty solid defense even without a ton of talent. Guess what was missing from the bad Diaz defenses at Texas? Next up is talent, because effectively reading and reacting to what athletic people are doing requires a degree of athleticism on your own end. Finally there’s scheme. Even I could draw up a few different schemes I’ve seen effectively employed to defend modern spread offenses that can credibly work with the right players and talent. 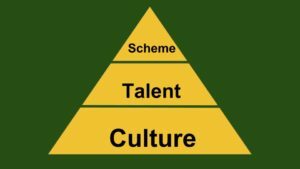 Scheme is valuable and important and the best teams have good schemes that help their players out, but without culture and talent it’s useless. The #RhuleofLaw culture is designed to field teams that consistently play physical team defense. They’re regularly practicing tackling, pursuit, disguises, coverages, varying run fits, etc. Having a practice culture that forces players to develop physicality then allows Rhule to go grab raw, athletic players that may or may not have much size or technique yet and fashion them into good football players. Then there are his schemes, which are somewhat complex in comparison to what Phil Bennett was doing in Waco but with a few points of overlap. I’ve written a fair amount on the Bennett defense in the past, such as this preview of the 2015 unit. I’ve since learned more about it from reading MatchQuarters.com which is written by a Bennett assistant who really knows the details of the scheme and who has shared a lot of it with me (@The_Coach_A on Twitter). You can read that site to get as many details from that scheme as you’d want, it’s also similar to how things are done at Michigan State, Pittsburgh, Kansas State, North Dakota State, and even TCU with various tweaks and idiosyncrasies at each spot. Like those other programs, Baylor was a base 4-2-5 Over quarters defense that used other defenses as a change-up or supplement to that main structure. To that main structure, Bennett eventually added a 3-4 package that they used pretty extensively in 2016 due to an atrocious and young DL combined with the desire to get nickel OLBs Travon Blanchard and Pat Levels both on the field as often as possible. 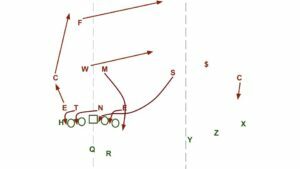 Even in that look quarters was the main call and they used the dime package to give them greater flexibility within that structure to bracket receivers to either side of the formation or to blitz guys like Levels into the backfield. Last year’s aggressive strategy got Levels to 5.5 sacks, helped DE KJ Smith get seven sacks, and led to multiple players piling up TFLs. Beyond the base defense there was a consistent philosophy every year from the Bennett Bear defense to apply heavy pressure on teams and encourage turnovers or quick punts back to the deadly Bear offense. They preferred to do this by getting as much speed on the field as possible and, as I noted in part one when mentioning the 2013 breakthrough team, getting speed on the field at linebacker was a crucial ingredient to their success. That underlying goal (applying pressure) and philosophy (emphasizing speed) will remain consistent under Rhule. 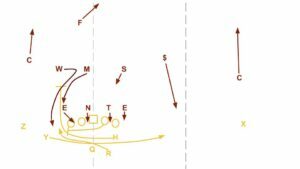 This is the dreaded “split zone” play which is inside zone with an extra back (usually an H-back, sometimes a “sniffer” fullback, here a second RB) trapping and kicking out the DE/OLB on the edge and creating a new interior gap for the defense to account for. When it’s paired with receiving threats on the perimeter it causes mathematical and geometric difficulties for the defense in trying to fit the extra gap. The goal here would be for the RB to bounce outside of the dimeback and into the arms of Orion Stewart ($) coming downhill from the boundary hash. The main problem with this approach, which reared its head pretty regularly for the Bears in 2016, is that it used 5-11, 190 pound Pat Levels to get inside and spill a block by a fullback or H-back, which is a pretty big ask of such a small guy. That wasn’t the problem in this example though. If you watch the clip above again you can now see that the main problem is that middle linebacker Aivion Edwards (#20) doesn’t plug his gap aggressively and the right guard is able to reach him and open up a hole in the B-gap for the RB to run through. DL Tyrone Hunt (#90) nearly gets over there and makes the tackle but isn’t quite able and the free safety and nickel fail to recover and make the tackle. Remember that the design of the D was to spill the ball wide to the DBs, not to have them fill downhill. It’s probably a safe guess that the culture of the 2016 Bears was not geared towards producing excellent team defense with the coaching staff essentially mailing in much of the season and the players surely understanding that the season was basically a wash. Whereas Bennett loved the balanced, two-deep structure of quarters, Rhule plays a good deal more cover-1 man and that is his base call for stopping the run. 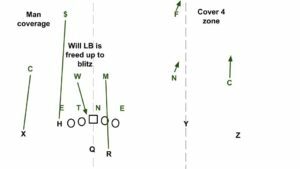 The advantage of cover 1 is that you get an extra man to use in the run fit while the difficulty is that by dropping a safety down to one side you can get into trouble against motion whereas a quarters team has a more balanced structure for sending help. Temple has a safety dropped but they trusted weak side linebacker Tyler Matakevich to play in space so they didn’t have to worry about chasing motion or rolling one safety deep and dropping the opposite guy down because they aren’t concerned with keeping a safety on that slot receiver. To handle the trap block they have their DE crash inside to spill the play and free up the weak side and middle linebackers to rock back, pushing the ball to the sam/nickel in the cutback lane. The safety is responsible for the perimeter threat, in this case a sweep and in another instance perhaps a bubble screen, while the sam/nickel waits to see where the ball goes and then helps clean up. Playing this style requires outside linebackers that can really cover ground laterally and the Owls often responded to life after Matakevich by playing a sort of dime defense with Stephaun Taylor (5’11” 206) and Avery Williams (5’10” 224) as the outside linebackers. You may have noticed in that clip above that the boundary corner is pretty far off the ball, the Owls were counting on Matakevich to make deep, quality drops to help out on quick passes underneath to the boundary. He had five interceptions that season while leading the team in tackles so it was a reasonable proposition. So the underlying principle of using a safety to help outnumber the run game is consistent from Bennett to Rhule but Rhule likes to send his linebackers to the point of attack rather than spilling the outside to safeties. And of course, he’s using cover 1 and fleet-footed outside-backers to maintain balance across the formation rather than Bennett’s two-deep shell. Because Temple based so much around man coverage they often mixed in man-under coverages, when they played two-deep they were usually playing man coverage underneath or they were playing Tampa-2 which they mixed in as a constraint on teams that tried to attack their safeties with man-coverage beaters. Bennett’s blitzes were often a bit more complicated than this, frequently involving stunts by the DL, but the gist was that they could play mix man coverage with zone. The benefits of this are pretty great since you can bracket a particularly troublesome receiver with a deep 1/2 safety rather than being married to the three-deep/three-under structure of a fire zone. Since they’re already playing so much single-high safety coverage, Rhule tends to use the modern fire zone structure of a single deep safety, man coverage outside, and then matchup coverage underneath between the three underneath guys and the three inside receivers for the offense. 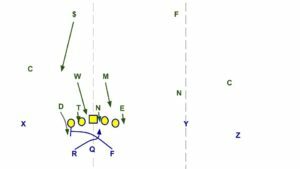 However, Rhule will also mix in two-deep/four-under blitzes. They’re dropping DE Haason Reddick into the underneath zone on the boundary, where a cover 2 corner would play, dropping the boundary corner into a deep zone where the safety would be, and then rolling the boundary safety to be a deep 1/2 safety on the other side of the formation. The nickel/sam linebacker and middle linebacker overload the edge while the will linebacker and strong safety are looking to get wide to the three-receiver side with the corner. On this play USF gets confused with their blocks and the Temple corner (freed to play aggressive by the new deep 1/2 safety) blows it all up. Again, this is made possible only because Temple has a speedy guy in Stephaun Marshall at weak side LB to move laterally in space. It’s pretty crazy stuff and the weak spots are difficult to discern in the short moments a QB has to make a decision, this is particularly lethal against RPOs which require much faster decision-making than drop-back passing. So the big question now is how much of this can get installed in year one with Rhule? It looks as though they’ve settled on Taylor Young to play that Matakevich role while manning the middle with Clay Johnston. I was actually very high on Johnston coming out of high school and had him pegged as a future weak side linebacker for Baylor in the mold of an Eddie Lackey because of his lateral speed. Bennett made him a DE/OLB last year as a redshirt freshman and now Rhule is moving him back to mike. He learned to play blocks physically at DE/OLB and that’ll be useful once he learns how to play the run quickly from inside-backer, meanwhile I’m sure they’ll make use of his range in their Tampa-2 schemes. Indeed you can see him playing some Tampa-2 deep middle linebacker in their spring game here. Rhule is going to need to find some DBs from Bennett’s bunch that can play man coverage and be physical in the middle of the field, this might take some time simply because there will be so much for the leftover safeties to learn to play in this defense. Highly touted recruit Davion Hall, who Baylor beat Alabama for by offering him the chance to start at WR, is going to need to prove he’s all-in on defense to see the field. Two-year starter Chance Waz will need to prove he can take advantage of being put in advantageous spots and make more plays on the ball to be a three-year starter. From the sounds of it we should probably expect to see younger guys like Lenoy Jones (prospective starting Sam LB) and Eric Ogor (another potential hybrid OLB) find roles in Rhule’s nickel and dime packages this coming season. The returning cornerbacks are in better shape since they won’t be strangers to man coverage or playing without help over the top. Defensive line is probably the big question. Brian Nance is back after whatever it was that held him out this last time and K.J. Smith returns after leading the team with seven sacks a year ago. Younger DTs Ira Lewis, Bravvion Roy, and Tyrone Hunt should benefit from a full offseason of physical and demanding practices and Rhule and his DC Phil Snow will have much more to work with here than Bennett did a year ago. I wouldn’t expect the switch to flip and Baylor to play outstanding team defense in year one, not at the level they played at up in Temple. Rhule had more talent in Philly and more time to instill his culture and teach his schemes, but they Bears have been decent in the recent past and should be at least decent again. Look out for this team in year two. Here are some nice resources on the 4-3 Over/Quarters defense as Narduzzi was using it at Michigan State. Narduzzi’s D has evolved some since (I’ve seen some of this, it’s excellent) and is a bit different from what Bennett was doing but there are major overlaps. 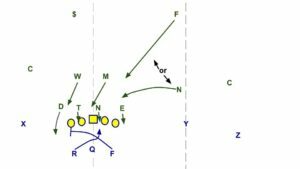 I think these Vanderlinden works on the Penn State defensive school (eagle and stack defenses) explore more of the origins of the Rhule defense, particularly the emphasis on single-high coverage and zone blitzing. With the high-pace offenses in this conference, don’t you think that Rhule will likely dial back on the zone blitzing? There are a ton of hybrid slot RBs who drool at the prospect. No, he’ll bring the blitzes as much as he can. Works great if you have disruptive players up front, which much of the B12 lacks. How do you think TCU led the league in sacks last year, btw? Given our mediocre interior DL I presumed we did pretty well in coverage sacks (tee-vee doesn’t give you the full field). Did not notice that we did that much blitzing at all. Disruptive talents aside, if you’re dogging early against the hurry-up you’re taking a fair amount of risk against these conference offenses where almost everyone has length on the edges and 4.4 waterbugs in the middle. West Virginia has been one of the better Ds over the last two years and have done so with even more aggressive blitzing than what Rhule has done, often bringing six or seven. The good Charlie Strong D fire-zoned, TCU fire-zoned a lot last year, OSU fire zones, K-State fire zones…it’s pretty standard procedure. It can be just as risky to sit back and try to hang on against B12 offenses as it is to try and attack them and force the QB to make a read. You have to field players that can force hurried decisions and prevent the QB from having a clean and easy pocket to throw from though. I seem to recall that Gary has become far less dog-happy on standard downs than he was, say, ten years ago. But in the best tradition of college football fandom I have zero evidence to back up that assertion. There were definitely games last year where TCU was bringing Fire zones early and often. OU and Baylor, for instance. We may be splitting hairs (hares? heirs?) here. When you drop a DE and bring another guy to the LOS at the snap, I don’t call that a blitz. To me, a blitz is bringing more than four guys. Frog backers tend to be guys that can execute a delayed fire zone when a lane flashes open and the coverage fits allow for a release. We had a guy in 2014 that made his bones with that move. Anyway, if Rhule can routinely bring 5 on standard downs in this conference and survive, then more power to him. Frogs brought five-man blitzes in front of single-high coverage pretty often though, that’s what I’m saying. I defer to your DVR. Thanks for your stuff, Ian. PS: This is an interesting time to watch college football in Texas, with the coaching changes this year in Austin and Waco. Next year may bring similar changes in Lubbock and Collie Station. I doubt that all Frogs fully appreciate what a great run of stability we’ve enjoyed. I think the next phase of Patterson-era TCU is going to be good, perhaps the best. He’s just gotta get the balance right on offense and with practice to get back to the level of defense they were playing before the Air Raid. Also he has to find another QB, but I think he’s done so with Robinson. Lubbock and College Station are probably changing. Phillip Montgomery and Chad Morris are the names I hear for each respective program. Be nice to get the veer and shoot back in the Big 12 and it belongs out in West Texas more than anywhere else, imo. I do hear that Sumlin has stabilized some staff issues in College Station so maybe he surprises and comes back for more, Morris has to win more to steal his job, also.